Dentures are sets of artificial teeth designed to fit inside the mouth. They are worn by people who no longer have their natural teeth. When natural teeth are removed, the jawbone begins to deteriorate. Over time, this affects the shape of the jaws, which can cause dentures to shift uncomfortably inside the mouth. To hold dentures in place, an adhesive can be placed along the inside of the prosthetic before insertion. This will hold the denture steady throughout the day, allowing the wearer to function with a higher degree of confidence and comfort. Most over-the-counter denture adhesives use some form of zinc as an ingredient, which can cause side effects. So instead, you can make your own denture adhesive with peanut butter or bubble gum, a more natural type of adhesive than those available on the market. Although this type of denture adhesive works, it does not work as well as those sold over the counter and only gives you a four- to five-hour adhesion. Measure 1 oz. of karaya gum powder into a small bowl. Add 3 oz. of tragacanth powder. Stir until the two are well blended and then transfer to a small bottle. Add 30 drops of peppermint oil. Place the cap on the bottle and shake vigorously for one minute or until the oil and powders are thoroughly mixed. Sprinkle ¼ teaspoon of the gum blend across the surface of the denture and insert into the mouth. Hold firmly in place for 30 seconds and release. The gums should bond lightly with the exposed tissues of the mouth, holding the dentures in place for up to 12 hours. For a less traditional take on the gum adhesive, try making a denture bonding agent from standard-issue bubble gum. The ingredients are easier to find and the flavor can be a bit more pleasant. Begin by placing 1/3 cup of unwrapped gum pieces into a microwave-safe bowl. Microwave the gum for one minute on full power. Mix well with a wooden dowel rod or wooden stick, until the gum is thoroughly blended. Measure ¼ cup of confectioner sugar onto a sheet of waxed paper. 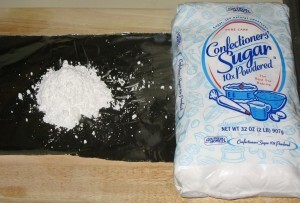 Push the sugar into a pile and use your fingers to create a small well in the center. Transfer the melted gum to the well in the sugar. Use your fingers to move the sugar from the sides to the top, covering the gum completely. Then roll and press the gum, manipulating it until all of the sugar has been incorporated. The gum mixture will be stiff, but not overly sticky. Pull off a piece of gum about the size of a standard marble. Wipe the inside surface of the denture with a moist cloth and then stretch the gum to fit across it, pressing the edges of the gum into the curvature of the mouthpiece. Insert the denture and bite down, pressing it into place. This should hold your dentures in position for up to four hours. Any leftover gum should be wrapped in plastic cling film. It can be safely stored at room temperature for up to four weeks. Notorious for sticking to the roof of your mouth, peanut butter can be a quick fix for dentures. Dip a wooden dowel or stick in a jar of peanut butter, and place a dab on the front part of an upper denture. Make the dab about the size of a pencil eraser. Add a dab to each side of the upper denture near the molars. Make the amount about the size of a large pencil eraser. 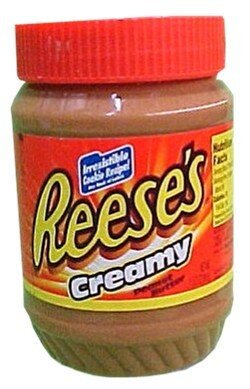 Spread the peanut butter over the upper side of the denture. Insert it in place. Add a dollop of peanut butter to the front center of the bottom denture where the gum curve begins. Do the same on both sides, and spread the peanut butter within the bottom denture’s gum canal. Insert the denture as you normally do. Bite down and hold for 30 seconds to press both the apparatus into place and then go on about your business. Peanut butter can effectively hold your dentures in position for two to three hours, buying you enough time to get to the store to purchase the proper adhesive. However, all users must remember that denture adhesive is only a temporary measure to hold the dentures in place. The proper treatment for a loose denture is to visit the dentist as soon as possible to refabricating a new denture. This entry was posted in Denture, Uncategorized and tagged adhesion, bubble gum, confectionary sugar, denture adhesive, dentures, karaya gum powder, peanut butter, peppermint oil, tragacanth gum powder, zinc on September 1, 2011 by chzechze.